Robert Lee Hess (born December 19, 1991) is an American chess Grandmaster. In May 2012, his FIDE rating was 2635, fifth in the United States (first among American-born players). Hess achieved his final norm for the International Master title at the 2007 Cannes Open, and was later awarded the title by FIDE. 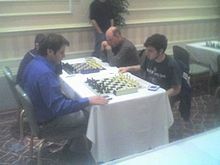 Hess achieved his first grandmaster norm at the 2008 Foxwoods Open, held on April 19 through April 23 at the Foxwoods Resort in Mashantucket, Connecticut. He scored 7-2, tying for first with grandmasters Alexander Shabalov, Yury Shulman, Julio Becerra, and Alexander Ivanov. Hess won his first two games against masters, then played seven grandmasters, scoring four wins, two draws, and one loss. His performance rating for the tournament was approximately 2770 USCF. Chess journalist Jerry Hanken called Hess's achievement "one of the greatest performances by an American teenager since the heyday of Bobby Fischer!" In April 2009, he secured his third and final grandmaster norm in the Foxwoods Open, soon after winning the SPICE Spring Grandmaster Invitational (where he made his second GM norm) and the K-12 SuperNationals tournaments. In the 2009 US Chess Championship in May, Hess tied for second with Alexander Onischuk, with a score of +5 −1 =3, losing only to eventual winner Hikaru Nakamura. He was on the silver-medal US team at the 2009 World Team Championships in Bursa, Turkey. Hess was awarded the 2010 Samford Fellowship "based on his chess talent, work ethic, dedication and accomplishments". He is also a member of the 2010 US Olympiad Team. In December 2011 he tied for first-second with Alexander Kovchan in the Groningen Chess Festival. Hess is a graduate of Stuyvesant High School in New York and now attends Yale University after deferring a year to play chess. In the 2007-08 school year, he was a sophomore and the co-captain of Stuyvesant's junior varsity football team, on which he was a starting linebacker. He is currently the Co-founder and Chief Operating Officer of The Sports Quotient.